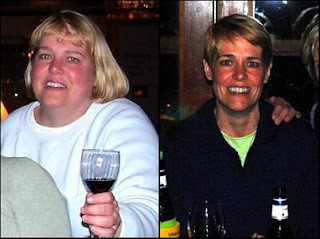 A Junk-Foodaholic's Journey to a Healthy Lifestyle: Stacy Allendorf Lost 120 Pounds! Stacy Allendorf Lost 120 Pounds! Doesn't she look incredible? Stacy Allendorf lost a whopping 120 pounds! “I remember physically feeling healthy, but emotionally I was shy and lacked confidence,” said Stacy Allendorf, a 49-year-old teacher from Columbia, SC. At her largest, 288 pounds, Stacy struggled with her fragile self-confidence as she turned to food to ease stress and give her temporary comfort. After marrying and giving birth to her son, Stacy suffered a string of setbacks and challenges that held her back emotionally and physically. She separated from her husband three weeks after the birth, then reconciled two months later; she transferred to a new school district with a difficult boss; and then, the most heartbreaking, her younger brother died in a car crash. Stacy traces her poor eating habits to a challenging childhood. Although she recalls a generally happy upbringing, playing outdoors and biking with neighbors, she spent a large amount of time eating sweets and baking desserts with her mother. When she hit puberty, she became bigger, which led her two brothers to nickname her “pig,” a hurtful term they used liberally. “Because I was so body-conscious, I became less active,” she said of her teenage years, in which she fluctuated between 160-178 pounds. “I felt awkward and clumsy. Becoming less active led to boredom and boredom meant snacking." She regained some self-confidence when she started college, but campus life proved disastrous to her diet: Too much work and stress combined with a food-loving boyfriend only intensified her poor eating habits. In 2003, Stacy was diagnosed with adult onset diabetes. Instead of changing her lifestyle, Stacy continued her bad eating habits. It was only the following year Stacy realized the extent of her lifestyle. During her son's freshman year in college, he put on over 40 pounds. Even worse, their weekly get-togethers consisted of going out for donuts or bagels. “He didn't move," she said. “I knew the road he was going down - my road! I finally saw my future retirement was going to be me lying around, slowly dying, unable to enjoy what could be the very best time of my life." To celebrate her commitment to change (and her birthday), Stacy ordered an exercise machine and got moving. She began with 30 minutes of aerobic exercise three times a week, and set a strict low-fat diet that required 1200-1500 calories a day. To stay focused, she kept track of her calories and exercise in a food journal. In just two weeks, Stacy noticed physical changes. "But it still took months before others noticed," she said of her early progress. "That’s how ridiculously obese I was." So as not to deprive herself, Stacy's plan included allowing one big, but healthy treat every week. Typically it was a four oz. filet with a baked sweet potato, with brown sugar. Then once per month, she allowed herself an extravagant splurge like key lime pie or vegetable pizza. Stacy lost 70 pounds the first year and 50 pounds the following year. She has maintained her 120 pound weight loss for over a year. Stacy credits her incredible weight loss to taking baby steps and rewarding herself for successes along the way. Now, at 163 pounds, Stacy has reversed the diabetes. She staved off high cholesterol and heart disease. Check out Stacy's reveal on The Today Show here. Kymm Hansen Lost 144 Pounds!